India’s coastline stretches 7,500 km and supports almost 30 per cent of the country’s population. While at least 219 ports and 87 power projects have been commissioned or proposed in the coastal areas so far, the government has done little to provide information on the ecological impact of these activities. The National Coastal Protection Campaign (NCPC), a joint initiative of non-profits working towards protecting the coasts and the coastal communities from haphazard development, has now developed a web-based application to monitor the coastline. The application uses satellite images to look at the development happening along the coastline and collect data on villages and communities living there. Once launched, the application will help researchers, planners and communities know the exact location of the development projects initiated on the coast with reference to the legal boundaries of Coastal Regulation Zones (CRZs) and high-tide and low-tide lines. Several companies promoting development projects in coastal regions have been accused of flouting the laws, grabbing land and destroying marine resources. 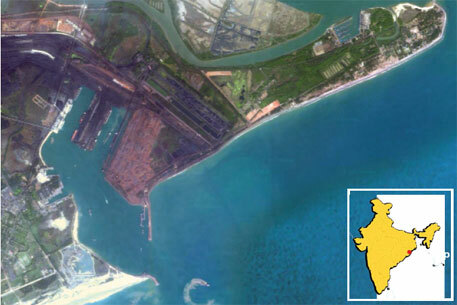 The Adani Ports and Special Economic Zone Limited in Mundra, Gujarat, has recently been in news for alleged violations of CRZ notification and destruction of mangroves in the Gulf of Kachchh. “There are several places where such violations are happening. It’s easy to grab coastal land because it is not a private property,” says Probir Banerjee of PondyCAN, a non-profit dedicated to preserving the natural, social and cultural environment of Puducherry. Since there is no integrated information on location and extent of these projects vis-a-vis legally restricted zones, it’s easy for the industry to get away with violations. “Once this application is launched, citizens will have the power to question them,” says Banerjee. NCPC is planning to launch it on October 10, during the Conference of Parties of Convention on Biological Diversity in Hyderabad. The application uses Geographical Information System-based maps and marks all the ports, power plants, sea walls and settlements at state, district and taluka levels. Data on coral reefs, mangroves and sea grasses will be added to the application later. “It will be run through crowd sourcing. Users will edit and update information from their region. They are the best people to tell what is happening on ground,” says Sudarshan Rodriguez of Tata Institute of Social Sciences in Mumbai. He has consolidated the data and maps for the application. “The absence of interdepartmental and Centre-State coordination is the biggest obstacle to fostering sustainable coastal management strategy,” says V Vivekanandan, convener of NCPC. The country had the technology for digitising maps for more than a decade, but the government did not create digitised maps on coastal resources. “Unless you have maps, a zoning law like CRZ is not implementable,” he says. According to an estimate, there is a port every 28 km on the Indian coast. In Odisha, ports of Adani Ports Limited and South Korean steel company POSCO are proposed to be built just three km apart. “They are 14 km from the Paradip port, already running below its capacity. Every firm wants a port of its own. There is no estimate of how many ports we need and what is the carrying capacity of our coasts,” says Rodriguez. “The government has the atlas of coral reefs, mangroves and sea grasses but only hard copies are available. We will continue working on our application and hope the government will also make the information on coasts available at one place. We have shown them how to do this,” says Banerjee. A web application sounds very interesting. I am however unable to find the web app anywhere online, could you please provide a link here. Thanks!